In a bid to sustain food security in Nyeri, H.E. 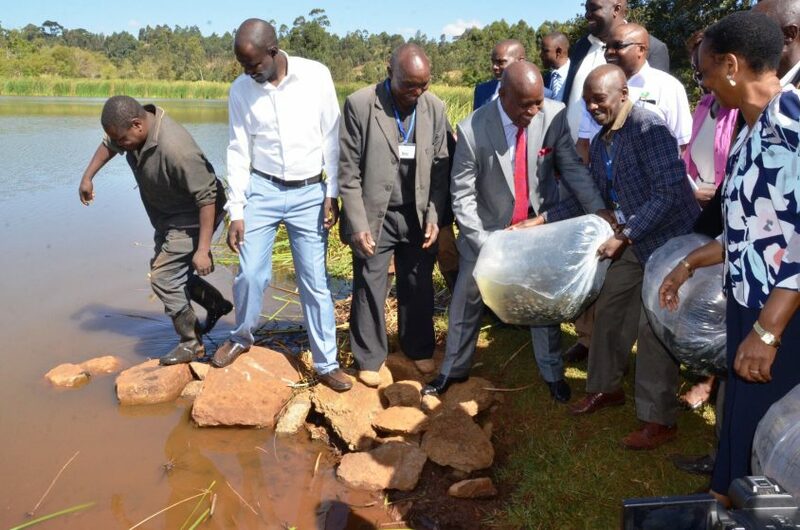 Governor Mutahi Kahiga distributed fingerlings to Kiunyu Fish Farming Self Help Group members in Kiunyu in Ruring’u Ward Nyeri Central Sub County on Wednesday 20th March 2019, in line with the National Government’s Big Four agenda, of ensuring food security. 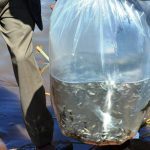 Over 7,200 fingerlings purchased by County Government of Nyeri will take 6 months to mature. 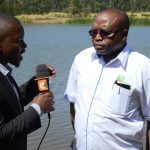 Other public dams scheduled for restocking later this month are Karangia dam in Tetu, Kagunyu dam in Mukurwe-ini, Mbuki dam in Othaya, Kiamaina dam in Mathira East, Gathathini dam in Kieni East, Hiriga dam in Mathira West and Ithemuigi dam in Mukurwe-ini East. 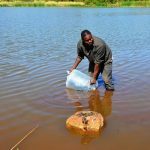 Also a total of 226 fish ponds rehabilitated last year all over the County will be be restocked with over 50,000 tilapia monosex fingerlings later this month.164,000 other fingerlings will delivered later in the month of April. During this financial year,the County Government has targeted to install 35 fish cages which will be stocked with 1,000 fingerlings .Cage farming is a new technology in aquaculture that allows for intensive fish farming leading to an increase in fish productivity. 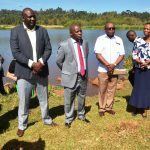 The Governor asked the youth to venture into fish farming since it has a big untapped potential and his government has laid out concrete plans to make it vibrant in Nyeri County. Last year, Chinga Dam benefited from this initiative and the fish are almost ready for harvest now. The County Government of Nyeri is in the process of operationalizing Wamagana fish factory that will be used in the processing of the harvested fish and the fingerlings will aid in the revival of the factory. With time a recreational center will also be set up among them being a curio shop which will help in attracting the youth. The Self Help group also requested for aid in form of boats that would boost domestic tourism. The Governor , through the Department of Agriculture will oversee fencing of the dam, provision of motor boats and silting. The Governor insisted that ownership of the program would help in succeeding of the fish farming. The governor was accompanied by the acting CEC Agriculture, Livestock and Fisheries Robert Thuo,Chief Officer Ruth Mwangi, Chief of Staff Paul Wambugu and Ruring’u ward MCA Hon Samuel Kariuki, Karia Youth Group Chairperson Dr. Nderitu Wangui, Chairperson Kiunyu Fisheries Christopher Wachira and Secretary Kiunyu Fisheries Gertrude Wairimu among others.